With the cost of diamonds being high, costume or fake diamonds have become quite popular. Fake diamonds are simulants or imitations, which are materials intended to look like or imitate a diamond. Popular diamond simulants are cubic zirconia, moissanite, and even glass or plastic. Diamond simulants can be good options for couples looking for an affordable yet stylish engagement ring. Many reputable retailers carry fake diamond rings that are made from high quality materials and closely resemble an actual diamond. If you're looking for an engagement ring made with fake diamonds, start with these retailers. QVC offers the Diamonique jewelry collection, featuring cubic zirconias (CZs). The Diamonique brand offers a range of different ring designs from simple to ornate, including engagement rings with a matching wedding band. The rings are fabricated from sterling silver, 14k white and yellow gold, or gold and platinum clad, which is a thin layer of 14k gold or platinum over sterling silver. Rings are priced from about $50 to $300. QVC offers a 30-day money back guarantee on their jewelry. The Eternal Love ring features a round cubic zirconia centered in a 14k yellow gold ring with more CZs set through the shank of the ring. 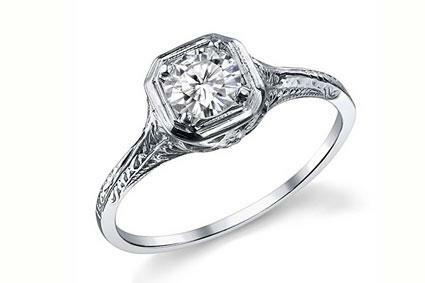 The ring retails for around $250 and is also available in 14k white gold. The Epiphany Bridal Ring Set features a three-stone setting with cushion cut cubic zirconias centered in a platinum clad ring with a split shank. There is also a matching wedding eternity band with cubic zirconia stones. The ring and band are sold together and retail for around $100. Consumer review hub SiteJabber gives QVC an average rating of 4.5 out of five stars, noting their reliable shipping and easy return policy. Moissanite Co. has many elaborate ring designs with multiple moissanite stones set in both modern and vintage-inspired styles. Options include traditional solitaires as well as artistic designs. The company carries rings with pave bands, split shanks, cathedral-style settings and more. Most rings are priced over $1000. Moissanite Co. offers free ground shipping on orders over $200. They recommend contacting them about returns within 30 days of purchase. Allow up to ten days to process your order. This antique reproduction ring features a round moissanite set in a 14k white or yellow ring, though you can opt for an old European cut stone for the same price. The matching wedding band is available for about $300. The ring retails around $450. This halo style ring offers an emerald cut moissanite set in a variety of metals including 14k white, yellow, or rose gold surrounded by round diamond side stones. Specify millimeter size of the emerald cut when ordering. 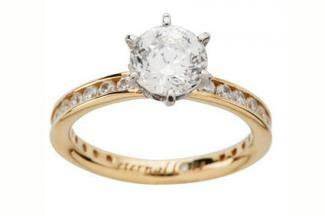 The ring retails from around $1,00 to $1,500 based on the size of the center stone chosen. This company receives mixed reviews for customer service though most customers agree that the product is exceptional. They note the shine and settings of the rings they've purchased as especially impressive. Fashion jewelry featuring fake diamonds can be found at many retailers including department stores. If you're in the market for costume rings or just something a little less pricey, try one of these options. JC Penney has a selection of very inexpensive fashion rings designed to look similar to diamond rings. With most under $50, you can find ones to match your style and budget. Some rings are sterling silver and feature cubic zirconia while others feature crystal stones and are set in brass. JC Penney offers a 60-day return policy that requires you to have the original receipt for your item. Many rings are limited in available sizes online though you can visit one of their retail stores for a wider selection. The DiamondArt Engagement 3-Ring Set includes a 3-carat round CZ with additional CZs on either side. The top and bottom rings also include channel-set CZs. The settings are all sterling silver. It's a showy set that is sure to draw attention. It retails for about $400. The Cubic Zirconia Solitaire Ring features a round CZ set in a white, silver-plated metal with round CZs through the shank. It's a classic design with lots of sparkle. The ring retails for about $30. As a department store chain JC Penney has locations around the country, so returns or exchanges can be made in-store or online. Reviewers at SiteJabber note that shopping online at JC Penney offers the same high level of customer service as you would expect in-store. Fantasy Jewelry Box features cubic zirconia rings in antique, classic and modern styles. Most designs are priced under $60 and set in sterling silver. You can find rings with simple single stones, three stone designs, large and flashy center stones, as well as ones mixed with other gemstones. Fantasy Jewelry Box features free shipping on orders over $75 and a 30-day return policy. They often offer a free pair of earrings with orders over $50. Paula's Antique Style Cubic Zirconia Ring features a round cubic zirconia in a rhodium electroplated sterling silver setting that features vintage details like milgrain edging and inlaid round diamonds on the band. The ring retails for about $30. The Grace Sterling Silver CZ Ring offers a square shaped cubic zirconia in a sterling silver, rhodium plated mounting with round CZs on each side. The ring retails around $30. This company has been featured in a variety of magazines, from Bridal Guide to Woman's World, in spreads that highlight their affordable options. Shop for a spare: If you don't want to wear your real engagement ring on a trip or outing, consider getting a costume one to wear in its place. 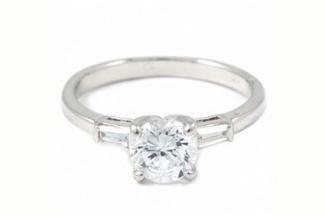 You can often find a similar design to the ring you have with a much lower price tag. Consider the setting: Just because the stone you are purchasing is not a natural diamond doesn't mean that you need to skimp on the setting of the ring. Fake diamonds can be set in precious metals such as gold and in stylish settings. When shopping for a ring, keep this in mind and if you decide later to replace the stone, you can often keep the same setting. Be honest: Never try to pass off an imitation diamond as a real one when giving an engagement ring. This can hurt your future spouse and make a lasting impression. Make sure that you both agree on using a costume ring for your engagement ring and choose something that you both will be happy with. There are plenty of reasons to choose an imitation diamond for an engagement ring or other piece of jewelry. There's no need to be embarrassed about buying or wearing an imitation diamond since they can often resemble a natural diamond and have numerous benefits that can make them quite appealing.